An over-toilet frame makes getting on and off the toilet both easier and safer. It raises the toilet seat height and has armrests, which are an alternative to rails. 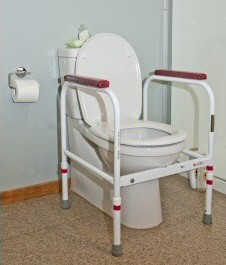 The over-toilet frame has four adjustable legs, a plastic toilet seat, a splash guard, and armrests. The legs are adjustable in 2.5 cm steps. In case the floor is not level, one of the legs has extra adjustment holes every 1.25 cm. These can help to stop the frame from wobbling. How do I install an over-toilet frame? Lift up the existing seat and lid before fitting. You might need to remove the seat and lid entirely so the frame can fit properly. Find the row of holes on each leg of the frame and the small button that will be in one of the holes. To change the height of each leg, push the button in and slide the lower leg section up or down. Make sure the button pops out of the hole to lock it in position. Place the frame directly over the toilet. Lift the seat of the frame and put the splash guard in place. This clips onto the frame and goes partway down inside the toilet bowl. Sit on the seat and make sure it is at a comfortable height with your feet firmly on the floor. How do I clean and maintain a toilet frame? An over-toilet frame is in constant contact with moisture and body fluids. You will need to clean it as regularly as you clean your toilet. Use warm soapy water or regular household cleaner, and remove the splash-guard for a good clean. What is a toilet surround? A toilet surround is an alternative to putting rails by your toilet to make it easier and safer to get on and off the toilet. Usually the surround is supplied with the legs adjusted to the shortest length so you can fit it into a car more easily. How do I install a toilet surround? When you get it home, you will need to adjust the legs. Find the row of holes on each leg of the frame. There will be small button in one of the holes. To change each leg height, push the button in and slide the lower leg section up or down. Once you get the correct height, make sure the button pops out of the correct hole to lock it in position. Sit on the toilet seat, to make sure you can use the arms of the surround easily and that they are at the right height for you. If you need more information about how to use a toilet frame or surround safely, contact your retail supplier or an occupational therapist. Written by the South Canterbury DHB. Adapted by HealthInfo clinical advisers. Page created July 2017.